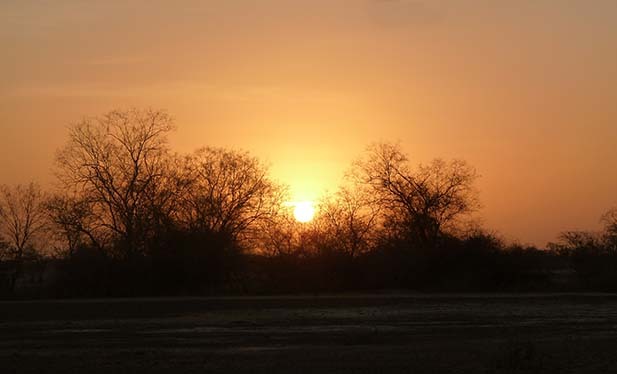 The Reo Project is located in Burkina Faso, approximately 150km by road west of the capital Ouagadougou. The project comprises six exploration permits (two of which are current, with extension applications pending on the remainder) in which the Company has a 100% interest. The exploration permits collectively cover an area of 1,002km2 (click on the Open Map tab to view tenement locations). The project area straddles the structurally complex junction of the well-endowed Boromo and Houndé greenstone belts, where thrusted against the central Burkina granitoid massif. The geology comprises a typical Birimian greenstone succession of felsic to mafic volcanics and derived sediments, regionally metamorphosed from mid to upper greenschist facies, which are intruded by syntectonic (belt or Dixcove type) granitoid stocks. The project is located 90km north of the historic Poura gold mine (1.5Moz), 70km northeast of the Mana gold operation (7.4Moz), 80km southwest of the Bissa gold mine developed by Nord Resources and immediately adjacent to the Perkoa volcanogenic massive sulphide (VMS) zinc deposit, developed by Glencore International plc. The Reo project area was originally selected by Newmont on the basis of a regional (cratonic) study. Between 2007 and 2010, gold mineralisation was identified by Newmont at six main prospects, variously referred to as Morley, Goumi, Dassa, K4, K5 and East. A further prospect, Samba, was identified by MDI’s subsequent exploration. These principal gold prospects are primarily associated with the regional Yako shear zone, particularly where the structure is deflected around the western margins of the Didyr and Samba granodiorites, with the more significant K4/K5 Prospect located in a classic pressure shadow site at the southern extremity of the Didyr batholith. 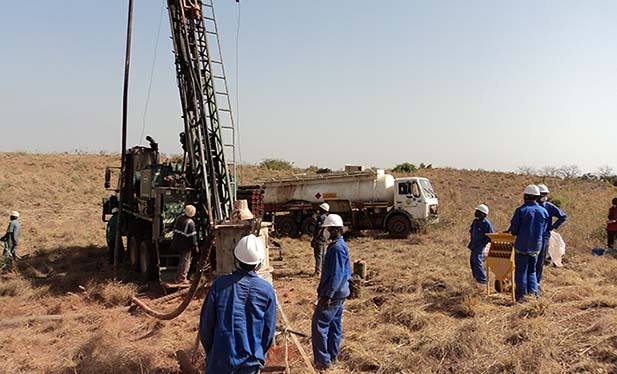 On the 16th May 2018, Tajiri Resources Corp. (TSX-V:TAJ) formally entered an Option Agreement to acquire a 100% interest in the Reo gold project in Burkina Faso via aggregate cash payments of US$335,000 and the issue to MDI of 5 million Tajiri shares, plus a 2% net smelter return (NSR) royalty that Tajiri may elect to acquire for US$5 million. During the 18 month option period, Tajiri must pay all expenses associated with maintaining the Reo Project permits in accordance with Burkinabe law. The K4/K5 Prospect (Figure 1) comprises a cohesive 6km diameter soil and auger anomaly with peak values >1,000ppb (>1g/t) Au. No geology is exposed, as the area is predominantly veneered by transposed laterite. The K4/K5 Prospect has variously been assessed and defined via extensive auger, rotary air blast (RAB), aircore, reverse circulation percussion (RC) and diamond core drilling. A five hole (723.5m) diamond drilling program was successfully completed at the K4/K5 gold prospect in 2012. The purpose of this drilling was to determine the nature, geology, geometry and alteration associated with each of the five mineralised zones previously identified prior to infill RAB and pattern RC drilling. Two of the more significant diamond drilling intercepts comprised 3m at 11.52g/t (incl. 1m at 31.9g/t) and 3m at 11.45g/t (incl. 1m at 23.2g/t) Au. The diamond drilling has confirmed the stratigraphic and structural orientations associated with the majority of mineralised zones and defined an extensive, 7km long, mineralised shear system (Madi Shear Zone) lying along the southeast margin of the K4/K5 target. The target appears to comprise an extensive, zoned alteration system, variously dominated by silicia-pyrite along its axis, progressively grading outward to sericite, chlorite and carbonate assemblages, all of which are overprinted by quartz-carbonate veining. A 4,916m (156 hole) infill RAB drilling program was completed over the K4/K5 in 2013. The infill RAB drilling was designed to refine priority mineralised zones defined during the 2011-12 field season. More significant results included 36m at 1.25g/t, 16m at 2.66g/t (incl. 12m at 3.23g/t), 20m at 1.65g/t (incl. 8m at 3.17g/t), 8m at 4.68g/t (incl. 4m at 8.21g/t), 8m at 1.70g/t, 4m at 3.54g/t and 6m at 1.24g/t Au. The previously reported RAB and RC results at the K4/K5 target include 18m at 2.51g/t (eoh), 13m at 2.23g/t (eoh), 4m at 16.2g/t, 4m at 14.0g/t, 12m at 4.11g/t, 8m at 2.25g/t, 20m at 1.73g/t, 4m at 8.54g/t, 18m at 1.59g/t and 4m at 12.2g/t Au. The results define an open-ended, 2.5km long zone of continuous gold mineralisation coincident with the major, northeast trending and southeast dipping Madi Shear Zone, lying along the southeast margin of the K4/K5 anomaly. This represents a significant potential ‘stand-alone’ resource target and confirms the primary focus for planned RC pattern drilling. This zone comprises part of a 7km long auger anomaly, providing ample scope to extend mineralisation along the structure. A series of additional higher grade, open-ended, east-west trending mineralised zones, representing satellite targets that splay off the primary structure, account for the remaining significant drilling results returned from the K4/K5 target to date. Preliminary bottle roll cyanidation testwork was completed in 2013 on a suite of 17 individual samples derived from diamond core holes at the K4/K5, generating average indicative recoveries of 93%, 97% and 95% from oxide, transitional and primary ore types respectively. A trial 1km x 1km array induced polarisation (IP) ground geophysical survey was completed over a portion of the mineralised Madi Shear during the March 2013 quarter. 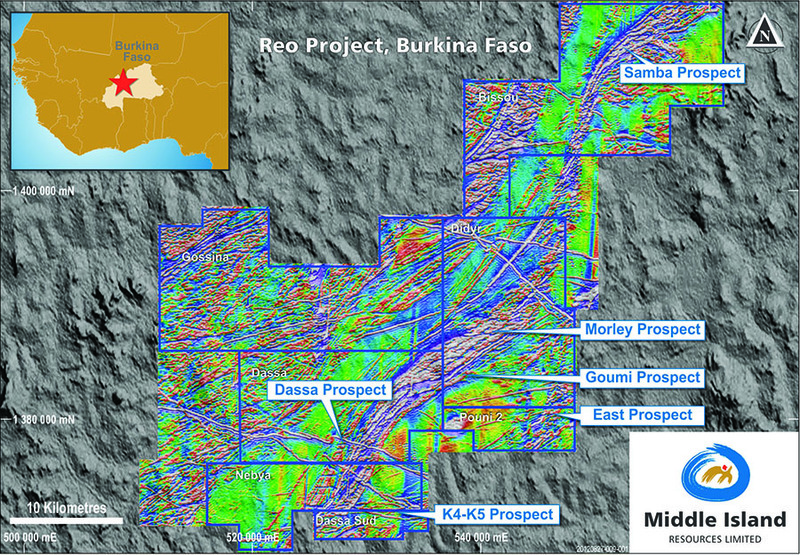 The survey proved successful in delineating both the primary mineralised structure and one of the three main satellite zones comprising the K4/K5 target. The successful trial survey sponsored the commissioning of a further four IP arrays, covering the known 2.5km mineralised strike length of the Madi Shear and one satellite target to provide better resolution of specific mineralised zones prior to a 5,000m RC drilling program completed in 2013. Coincident conductive and resistive zones were found to correlate well with known mineralisation and a new and untested parallel zone was identified to the immediate southeast of the Madi Zone. The more advanced Morley Prospect lies immediately west of the village of Didyr and comprises a 3.25km x 0.8km soil anomaly with a peak value of 500ppb Au. No outcrop is exposed at the prospect, as it is largely veneered by transposed to transported soils and laterites. 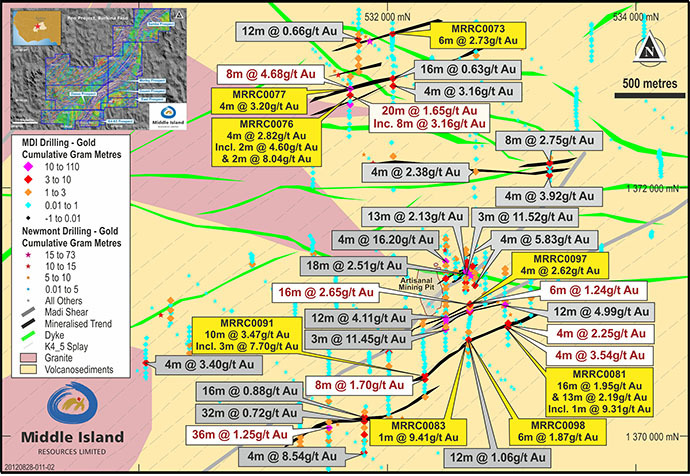 Newmont variously employed trenching, RAB, aircore, RC and limited diamond core drilling to resolve the mineralised zone structure and geometry, ultimately defining what appears to represent a series of broad, stacked, parallel east-west trending lodes that dip moderately north. Once a stand-alone deposit has been identified at K4/K5, the Morley Prospect (lying 20km to the north) would immediately represent a high grade satellite deposit. Brief summary of the Reo Gold Project.